Learn how to make a vignette look beautiful and effortless, while showing off your favorite objects and enhancing your interior home design. What is a vignette? Literary Devices.net describes a vignette as "a small impressionistic scene, an illustration, a descriptive passage, a short essay, a fiction or nonfiction work focusing on one particular moment; or giving an impression about an idea, character, setting, mood, aspect, or object." In the realm of interior home design, a vignette, or “table scape,” can be described as an artful arrangement of objects grouped together to create a scene, tell a story, act as a focal point, or simply to make a decorative statement in your home. It typically consists of a grouping of accessories chosen to complement a room's function or it's decorative details. Vignettes can be truly personal, informing the world of your tastes and interests. These home design arrangements may be composed of a variety of objects that have at least one or more things in common, or nothing at all. 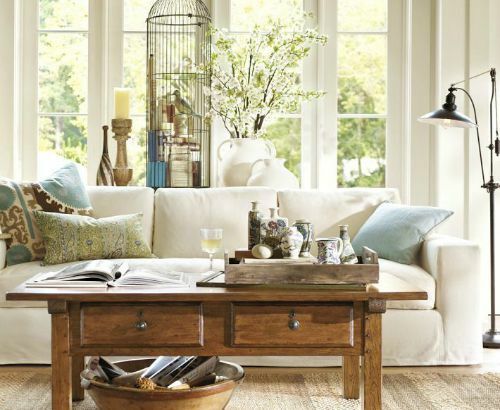 I enjoy browsing through "Pottery Barn" catalog for home design ideas. The vignettes are always stunning. Photo by Pottery Barn. A vignette should look uncomplicated, spontaneous, and unstudied. The following home design ideas for creating vignettes provide helpful tips to get you started. If you find something that works, though it may not follow the rules, by all means use it! Vignettes can be displayed on practically any horizontal surface. Create a vignette on a coffee table, console, shelf, windowsill, fireplace mantle, an upright piano, bookcase, kitchen or bathroom counters, as a dining table centerpiece, a nightstand, bedroom dresser, foyer table, even on the floor. Vignettes should complement the style, color, or theme of your interior home design. Generally, when assembling a vignette, the accessories you select should have at least one thing in common, a connecting element. Color combinations: If objects are all the same color, vary the shapes and heights. Shape: Vary the height of objects having the same shape. Vintage: A grouping of objects from your favorite vintage period can be charming. Theme: Beach themes, nature themes, Christmas, sports, movies, and so on. Textures: Group objects of the same or varied textures. Collections: With any kind of collection, avoid staging with too many small pieces, which will only look like clutter from a distance. Sabrina Soto, interior designer from HGTV, advises us not to use any object “smaller than a grapefruit” when accessorizing. What kind of objects can be used to build a vignette? 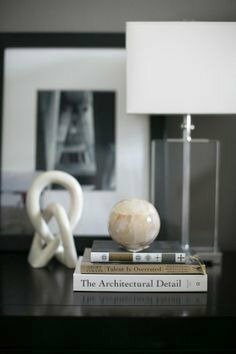 Vignette ideas: Sculptural objects, vases, a stack of books to add height, greenery, flowers, paintings, and framed photographs. Paper products like cards, unframed pictures, piano music, elegant restaurant menus...You can usually find a variety of vintage cards in antique or "junk" stores. Anything old with a patina, like a pair of antique binoculars, globse, mason jars, lamps, baskets, candles, mirrors, clocks, bowls, bottles, pretty soaps, boxes, picture frames…the list is endless. Vignettes are usually arranged in pyramidal or linear shapes. The pyramid-shaped vignette style consists of objects arranged in different heights in a triangular or pyramidal shape. Work in odd numbers of threes, fives, and so on. Odd numbered arrangements are the most pleasing to the eye as they appear less studied. See art of accessorizing. Avoid the temptation of adding too many pieces, which can look cluttered and messy. Start with an "anchor piece"
For the foundation of your vignette, select an object to be the “star” of the composition. Think of this as your “anchor” piece. This can be an object that has special meaning, fits a theme, or just appeals to you and will look good with your home interior design. This key anchor piece should be of considerable height or weight so that it’s substantial enough to “hold” the arrangement together. Examples of objects that work well as anchors are; paintings, mirrors, sculptural objects, lamps, a tall vase of flowers or a plant. Your eye should naturally go to the anchor piece first. Begin building your vignette by placing the anchor piece first and at the peak of the pyramid, (at the rear) and off center. Next, fill in the rest of the triangle with objects of varying heights, finishing with the smallest and shortest object at the base and to the front, always keeping in mind the pyramid-shape, or “A-shape” as you are building. Overlap pieces so that a part of each object can be seen. A good rule of thumb is to select objects that are half the size of the anchor piece. For a base, use a stack of books (hardcover and preferably, old) a mirror, a low basket or tray. Placing a mirror at the base will add depth to the vignette. 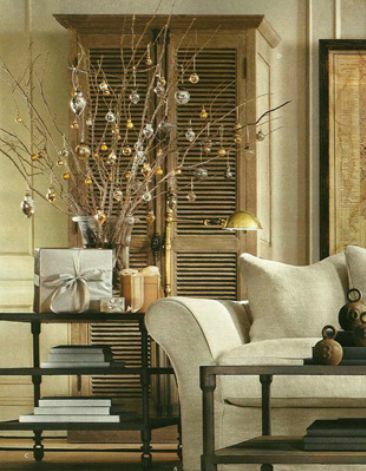 Elevate smaller pieces with; a stack of books, pretty boxes or candle pedestals. 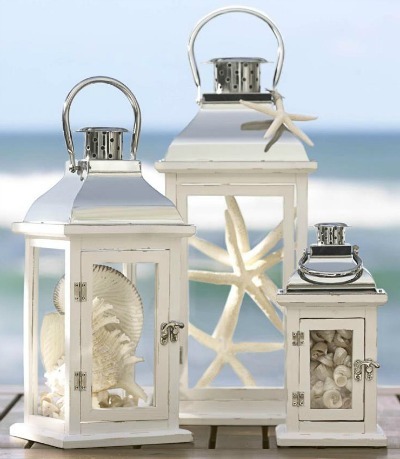 A lamp makes a great “anchor” piece, and the light will illuminate the arrangement. Cluster objects close together for cohesiveness. If the vignette looks too tight or studied, move the objects slightly apart. Overlap objects slightly, so that each item is visible. Objects can touch if desired. For floor vignettes, use large heavy objects, like floor mirrors, shutters or screens. Add live plants and sculptural objects, making sure they're in proper scale to the size of the room. Create vignettes to reflect the holidays. Let your vignettes “evolve” by adding or taking away objects. Symmetry, or formal balance, is for those who prefer order and formality in their interior home design. 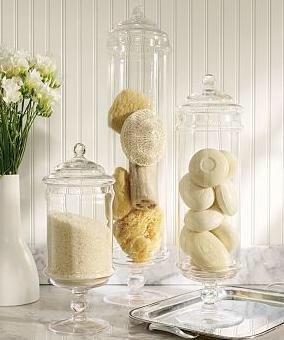 Arranging accessories symmetrically is easy, since you're simply trying to "match" each side of a room, table top or mantle. Asymmetry, or informal balance, is for those who prefer excitement, energy and creativity in their interior home design. If you like a casual look, asymmetry is for you. 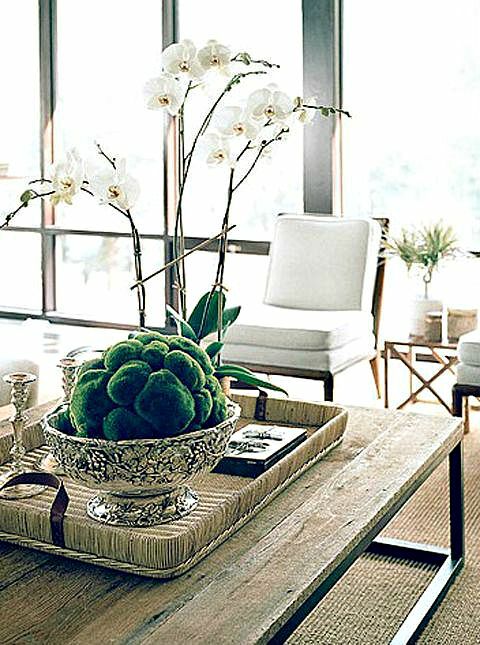 A properly executed asymmetrical arrangement should look effortless and unstudied, as if the items were just laid down. Be aware of the “visual weight” of each object. Objects don’t have to match perfectly to balance each other off. For more on this subject, see home interior design rules. Always be aware of the surrounding room décor when building a vignette. The backdrop becomes an integral part of your vignette, so be aware of color schemes or wild patterns that may clash with the objects in your display. Choose objects in colors and shapes that mirror or complement the background of a room. When building a vignette in front of a hanging painting or mirror, be sure they are hung low enough to become part of the arrangement. 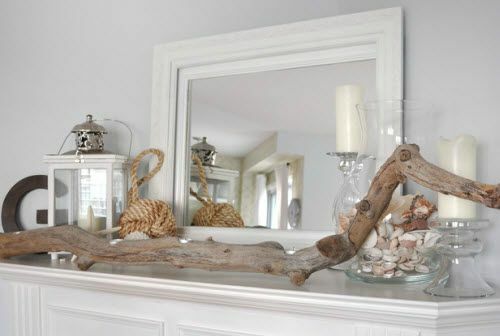 Mirrors make an interesting backdrop to a vignette, bringing added dimension and bouncing extra light around the room. Be sure that objects you place in front of the mirror look as good on the backside as they do in the front. The objects you use in your display can reflect the colors, shapes, or subject of a background painting or photograph. 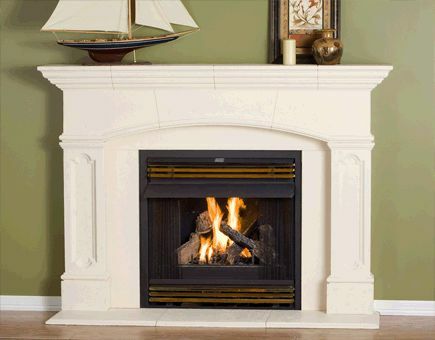 An easy interior designer tip for decorating a fireplace mantle is the “three-plus-one” trick. This decorating tip can be applied to other long flat surfaces, as well. I like to use this method to decorate my upright piano, which is always a difficult piece of furniture in any room. 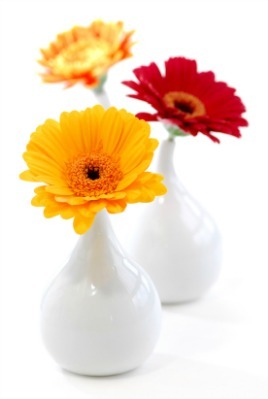 Begin this method by choosing three related decorative objects close to, but not of the same height. Place them on one side of the fireplace mantle. Remember to use the pyramid method when constructing these pieces; tallest in the rear, smallest in the front, and overlapping. Cluster objects together, not side by side. On the other end of the mantle, place a single large object two to three times the size of the other pieces. It should visually be equal in size to the three pieces on the other end. Balance: Several objects of similar height or color placed at opposite ends of a mantle or table can create an offset arrangement. Balance each side with a tall central object, like a mirror or a painting and a second grouping opposite. Proportion: Proportion refers to the size of an object relative to other objects in a room. Line: The lines of your vignette should give it a feeling of movement and even atmosphere. Rhythm: Rhythm is a key design element in successful interior home design-- it's the path your eye follows when you enter a room or look at a vignette. Color: The colors and patterns you choose should be evenly distributed throughout a room. Avoid placing all your accent colors (and patterns) on one side of a room. Pattern: Pattern is a decorative design or form that repeats itself. Patterns have a distinct effect on the look and feel of a room. 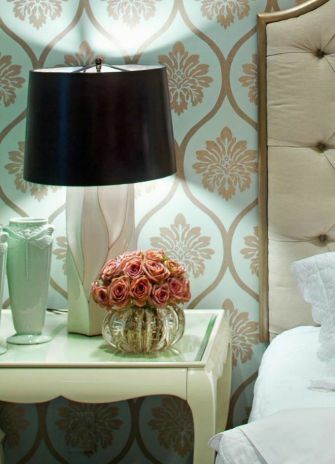 For instance, light floral patterns will lend a room a fresh and open feeling, whereas, large heavy floral or busy patterns can make a room feel formal or stuffy. Texture: Vary the textures of objects to liven up your vignettes. For instance, shiny, satiny surfaces will illuminate a space. Textures will provide shadow and depth. Contrast: Combine various textures to create interesting contrasts in your vignettes, like; place a smooth surfaced vase next to a handwoven rough textured basket. For home staging purposes, don't overdo it by creating vignettes on all the surfaces of your house, as the result will look cluttered and busy. Do just enough to show the function of a room, to highlight a particular decorative detail in your home, or to create a focal point. For more home design ideas, go to home interior design rules.